Right-wing bloggers blazed at the audible gasp that went up from the crowd when the Norwegian Nobel Committee announced (first in Norwegian, then English) that it had awarded the 2009 Nobel Peace Prize to US President Barack Obama. 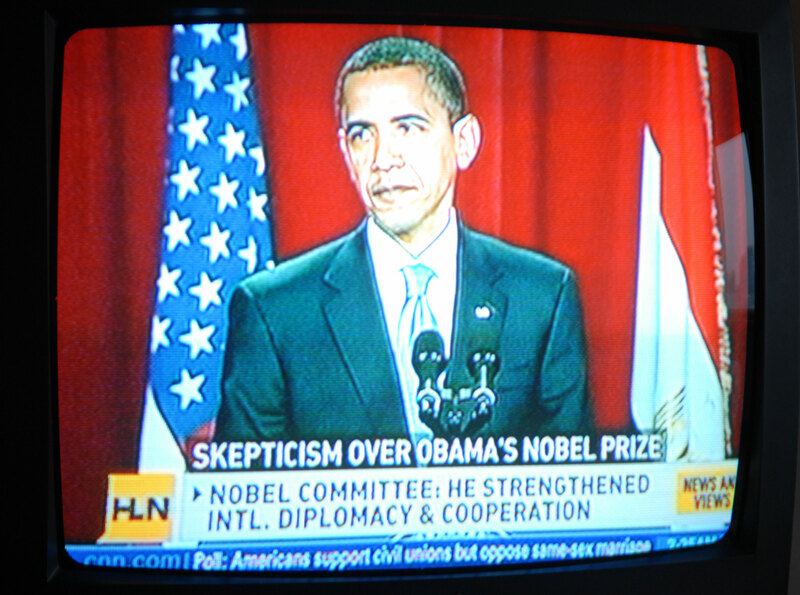 In its press statement, the Committee described Obama as heralding a “new climate in international politics” in which “multilateral diplomacy has regained a central position” with emphasis on “dialogue and negotiations” and the role played by the United Nations and other international institutions (tho not civil society). The decision to award Obama was certainly surprising, but in keeping with a recent trend by the Committee to award male leaders: Martti Ahtisaari in 2008, Al Gore Jnr. in 2007, Muhammad Yunus in 2006, Mohamed El-Baradei in 2005, Jimmy Carter in 2002, Kofi Annan in 2001, and Kim Dae-jung in 2000. Only two women have received the prize in the past decade: Kenyan environmentalist Wangari Maathai (2004) and Shirin Ebadi (2003). The last major civil-society based disarmament initiative to win was the International Campaign to Ban Landmines (ICBL) and its then coordinator Jody Williams, way back in 1997. But what of Obama? Much initial media criticism focused on his limited track record of achievements, but there’s no denying that the Obama Administration is serious about setting the US back on a course of multilateral diplomacy. In July 2009, the US signed the UN Convention on the Rights of Persons with Disabilities; this was the first international human rights treaty that the US has joined in over a decade. In August, US Ambassador Susan Rice delivered a remarkable address that acknowledged more can be done internationally if the U.S. “leads by example, acknowledges mistakes, corrects course when necessary, treats others with respect, and forges strategies in partnership.” Under instruction from the top, US officials have been canvassing civil society representatives, academics and other experts, in addition to governments, for their views on how the US can continue to nuclear disarmament ahead of the 2010 meeting of the Nuclear Non-Proliferation Treaty (NPT). As the UN First Committee got underway, news came through on Arms Trade Treaty deal struck between the UK’s Foreign Secretary David Miliband and US Secretary of State Hillary Clinton. For more than four years, the UK has been leading the charge for the creation of an international agreement to regular transfers of small arms and conventional weapons and it had drafted a resolution for diplomatic approval at the First Committee to commence and complete negotiations of an Arms Trade Treaty by 2010. Clinton issued a statement in support of the treaty objective on October 14, but made US support conditional upon the deal being struck by consensus. Arms Trade Treaty-naysayers China, Egypt, India, Pakistan, and Russia abstained on the resolution, which passed by a vote of 153 states in favour, 19 abstained, and one vote (Zimbabwe) against. Despite their abstentions, these difficult states will participate in the negotiations and it is highly unlikely that a “strong and robust” treaty will emerge. Progressive states such as Austria, Cote d’Ivoire, Germany, Ireland, Mexico, the Netherlands, New Zealand, Norway, and Switzerland expressed discontent at the consensus provision, but ultimately voted in support of the process. They could not provide a viable alternative after NGOs campaigning for an Arms Trade Treaty dithered for days on how to respond to the consensus caveat. So the next two years will show if this process can succeed, but the bigger question is why did the US insist on the right to veto or scuttle the final treaty agreement? Why does US re-engagement in multilateral diplomacy still come with a big stick? What about the US and nuclear disarmament? The Nobel Committee lauded Obama’s “vision of and work for a world without nuclear weapons” and Obama’s efforts have received widespread praise, but what is happening to achieve these goals? In highly-anticipated back-to-back statements to the First Committee, US and Russian officials outlined the steps that are being taken to negotiate a reduction in their nuclear arsenal, steps that showed much more effort will be needed to succeed. Neither government explained what would come after or articulated how nuclear abolition can be achieved. In an NGO statement to the First Committee, Dr Zia Mian provided a devastating critique of how the US, Russia, and other nuclear weapon states are continuing to modernise, expand, and retain their arsenals of nuclear weapons. Mian said it is “not enough” to talk about wanting “to create the conditions for a world without nuclear weapons” and challenged nuclear weapon states to “put up or shut up” on nuclear disarmament. The Obama administration is apparently considering its position on banning antipersonnel landmines ahead of the Second Review Conference of the 1997 Mine Ban Treaty, which the US has not joined. Human Rights Watch and other NGOs are calling on the US and 36 other non-signatories to the Mine Ban Treaty to participate in the “Cartagena Summit on a Mine-Free World” and relinquish antipersonnel mines. One opportunity for the US to give a clear signal that it is reengaging multilaterally would have been for the US to vote in support of the non-binding First Committee resolution supporting the landmine ban. Unfortunately, the US abstained on the resolution, defaulting to the position of the Bush administration. Nineteen non-signatories voted in favor. Much is being made of the ‘revitalised’ disarmament scene, one in which the US plays a constructive and cooperative leadership role. As Obama himself pointed out, the Nobel Prize is a “call to action.” We all know that actions speak louder than words. Obama needs to rise to the challenge and meet the expectation of governments and campaigners around the world. He could start with the easy one: Ban Landmines Now. NSP Research – Updates is powered by	WordPress 2.9.2 and delivered to you in 0.098 seconds using 22 queries.